When Brunelleschi (re)discovered linear perspective circa 1420, Florentine painters and sculptors became obsessed with it, especially after detailed instructions were published in a painting manual written by a fellow Florentine, Leon Battista Alberti, in 1435. 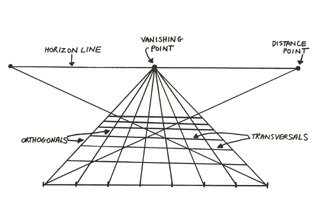 John Berger, an art historian, notes that the convention of perspective fits within Renaissance Humanism because “it structured all images of reality to address a single spectator who, unlike God, could only be in one place at a time.” In other words, linear perspective eliminates the multiple viewpoints that we see in medieval art, and creates an illusion of space from a single, fixed viewpoint. This suggests a renewed focus on the individual viewer, and we know that individualism is an important part of the Humanism of the Renaissance. Cite this page as: Dr. Steven Zucker and Dr. Beth Harris, "Linear perspective interactive," in Smarthistory, August 9, 2015, accessed April 21, 2019, https://smarthistory.org/linear-perspective-interactive/.